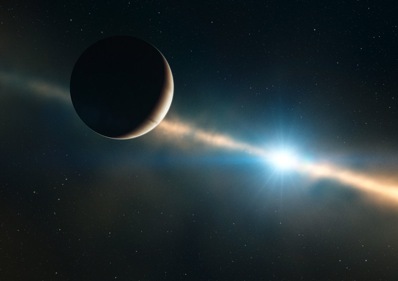 Astronomers have tracked, for the first time, an exoplanet orbiting around its host star. Of the 450 or so exoplanets that have been identified to date, around ten have been imaged directly. Of those, beta Pictoris b has the smallest orbit, tracking around its host star at an equivalent distance as Saturn is from our own Sun. On such a tight orbit it could take a mere 20 years to observe one complete orbit. For the first time, astronomers have tracked the motion of an exoplanet as it orbits its host star. 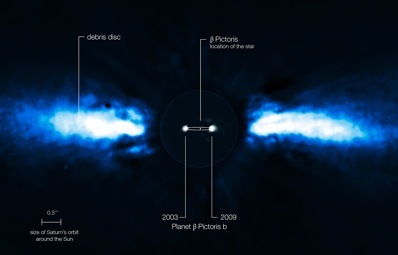 Beta Pictoris was imaged with the NACO instrument on the VLT in 2003, 2008 and 2009. The dust disc surrounding the host star is also shown here. Image: ESO/A.M.Lagrange. Astronomers used the NACO adaptive optics instrument attached to ESO's Very Large Telescope in Chile – which removes much of the blurring effect of the Earth's atmosphere to create sharp images – to study the beta Pictoris system 60 light years away. The central star is just 12 million years old and is surrounded by a dusty debris disc, demonstrating that gas giant planets can form within these discs in just a few million years. Artist impression of how nine-Jupiter mass beta Pictoris b might look inside the dusty disc surrounding its host star. Image: ESO/L. Calçada. Comparing images snapped in 2003, 2008 and 2009 revealed that the planet had moved from one side of the star, passed in front of or behind it and was thus drowned out by the glare of the star and couldn't be seen, to the other side. The planet, which has a mass of about nine Jupiters, is massive enough and located in the right position to be responsible for the warp in the inner parts of the disc. The observation also has important implications for models of solar system formation. “Together with the planets found around the young, massive stars Fomalhaut and HR8799, the existence of Beta Pictoris b suggests that super-Jupiters could be frequent byproducts of planet formation around more massive stars,” says team member Gael Chauvin. Direct images of other exoplanet systems also illustrates the diversity of planetary systems. “Among those, Beta Pictoris b is the most promising case of a planet that could have formed in the same way as the giant planets in our Solar System,” comments Lagrange. That is, by attracting gaseous material onto a rocky core. The planet may also have formed in the same close orbit as it is observed today, rather than the more distant exoplanets that orbit Fomalhaut and HR8799, for example, which would lie beyond the orbit of Neptune in our Solar System. These distant worlds likely formed via a different mechanism, perhaps at locations in the proto-planetary disc which were gravitationally unstable, or alternatively the planets formed closer in and moved further out because of gravitational perturbations.